The University of Florida Small Animal Hospital seeks dogs with a deadly stomach disease to participate in a study focusing on a new technique that UF veterinary surgeons hope will improve treatment of the condition. The disease, known as gastric dilatation-volvulus, or GDV, is a common medical emergency that affects dogs. Also referred to as bloat, the condition involves severe gas distention and an abnormal rotation of the stomach, and requires surgery to correct. Overall mortality rates associated with GDV range from 10 to 20 percent, depending on the severity and duration of the disease, said J. Brad Case, D.V.M., an assistant professor of small animal surgery at UF and lead investigator on the study. Although the exact causes of GDV are not known, factors associated with the disease include genetics, anatomy and the environment. Excessive ingestion of food or water has also been noted in some cases, veterinarians say. Among the symptoms associated with the disease in dogs are anxious behavior, depression, abdominal pain and vomiting. Once diagnosed, rapid and effective decompression of the stomach prior to surgery is critical for successful treatment of dogs with GDV, but most traditional approaches to decompression involve the placement of an oral stomach tube under heavy sedation and have a temporary effect, so gas can re-distend the stomach within minutes, Case said. 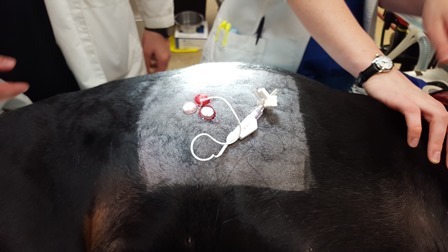 “As time is of the essence when treating this disease, the owners of dogs with GDV who are not located near a specialty veterinary surgical facility are at a disadvantage when seeking care,” he said. 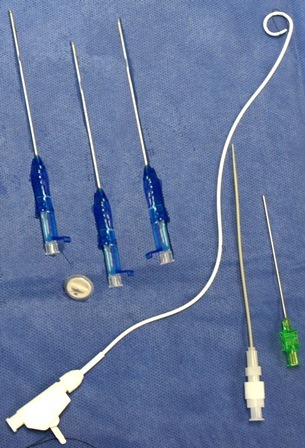 The UF study involves a minimally invasive technique, developed by Case and his colleagues, that employs a simple catheter method to provide immediate and continuous alleviation of the gas distention problem in patients with this disease. Currently, any dogs seen at UF that present with GDV are offered inclusion in the study, but Case and his colleagues would like veterinary practitioners to be aware of the study if they have cases they think would qualify. Dogs considered for inclusion in the study will receive a complete physical examination and a thorough medical assessment, along with preoperative bloodwork. Dogs that meet the criteria will receive immediate treatment with the newly developed decompression method while being stabilized for surgery, then will be operated on as soon as possible to correct the stomach rotation. While the overall cost of treating GDV patients can range between $2,500 and $4,000, study participants will receive up to $1,000 toward the cost of emergency stabilization, surgical procedures and any required medications or hospitalization. Funding provided by the American Kennel Club Canine Health Foundation and Poodle Club of America Foundation was used to support the study. For more information, contact Case at 352-392-2235 or visit the study website here.